This metal bin makes your fabulous gift even more spectacular. Mothers will love stashing diapers and other necessities inside and when that stage has passed it can hold Matchbox cars, art supplies or dress up jewelry! The classic look will complement any decor. Measures 12" long, 6" wide, 5" deep. Personalization available in block (as shown) or script. 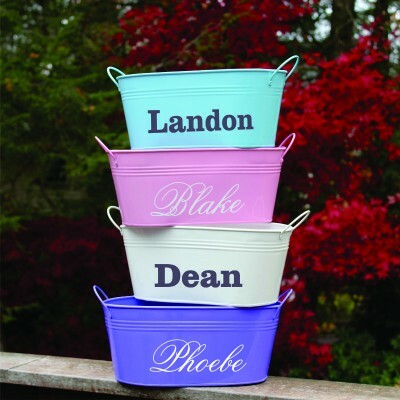 Our pink bins are presently out of stock.